Get More Creepy Halloween Recipes to scare your guests with at your Halloween party this year. Let's find some fun, easy and scary food ideas for your party and supply the recipes and directions you need to prepare them. There are so many Halloween recipes for you to choose from. Yummy I also have some easy to make Halloween Cupcake Ideas for you. Everyone loves desserts so when you are done getting your creepy Halloween party food list, take a look at the scary cupcakes...okay, they aren't that scary, but take a look at them anyway! Spider's Web Dip is just one of the creepy Halloween recipes you will find in this collection. It's really a Mexican dip that has been decorated to look like a spider's web. It's going to be a favorite among your party guests. Add one cup of sour cream to your mixture. Save the rest of the sour cream for later. Spread a thin layer of refried beans on the bottom of a microwaveable serving dish. I like to use a glass pie pan. Next put in a layer of shredded cheese. Put the dish in the microwave and turn it on for 20 to 35 seconds...just until the cheese is slightly melted. Now add a layer of salsa...make sure you drained it. Don't want it too runny. Now add a layer of drained olives on top of the salsa. The next layer will be the sour cream, cream cheese and taco seasoning mix combo. And then add a layer of guacamole. Put a large spoon of sour cream in the middle. Spoon the rest of your remaining sour cream into a plastic baggie. Cut the tip off one of the bag's corners. Beginning at the outer edge of the dip, draw a narrow circle around the edge using your sour cream baggie. Now, make another circle around the dip bowl, but make this one in between the outer edge and the center dollop of sour cream. Now you have the center of the dip, and two circles of sour cream. Using a knife blade, a toothpick or even a skewer, drag a thin line of sour cream from the center circle to the circle on the outer edge of your serving dish. Just stick the knife or toothpick in the circle of sour cream and pull it to the outer edge of your dish. Do this all around the dip and you will see the "Spider Web" pattern appearing. Keep making the "webs" or lines all around the dip platter. Place some black beans on the Web so they look like a few spiders! If you have any plastic spiders you can use them too. Serve your dip with some blue tortilla chips! See how much fun these Creepy Halloween recipes are to make...and wait until you see how everyone enjoys them. Ghoul's Cauldron is one of those Creepy Halloween recipes that's perfect to serve as an after school snack or as a Halloween party snack. It's not only easy to make, but this recipe serves about 20 people so it is ideal for your costume party. Get a medium saucepan and melt the cheese over a low heat. Stir it occasionally. Stir in the beans, the salsa and the jalapeno peppers. Cut out the center of the bread, leaving a bowl shaped shell...that's your cauldron! Do this carefully. Take the bread you have removed from the loaf and cut it into dipping sized pieces. Put one pretzel rod aside. Arrange the remaining pretzel rods on a serving plate so they look like campfire logs. Put your bread bowl, or cauldron, on the pretzels sticks. Pour the cheese dip into the cauldron and let some spill over the top of the bread bowl. Put the cut up bread pieces around the cauldron. Get the one pretzel rod you put aside earlier and place it into the cheese dip. Serve right away while it's warm. To make the display for this cheese dip recipe look scary, or at least more like Halloween, cut up some cocktail bread into scary shapes with cookie cutters in Halloween shapes. Aren't these creepy Halloween recipes fun to make! Once you understand that you want it to look a little gross, you get all kinds of good ideas...don't you? Spinach Dip is always a favorite party dip around here and we always serve it in a bread bowl...but on Halloween that's called a Cauldron and this delish dip is perfect to serve at a party. Again, take your bread and cut it with Halloween cookie cutters to have those holiday shapes around it. Spinach Dip is easy to make and is usually the first thing to go...people eat it right up. Make sure the spinach is squeezed out so your dip isn't watery. Mix up the ingredients and put into the refrigerator. Take the bread and cut out a circle. Rip the bread you cut out into cubes. When you are ready to serve put the dip into the bread and place the bread cubes around it. Add a scary spider or ghost food pick to the dip and you're dip is decorated for the holiday table. Creepy Halloween recipes should look almost scary but they should always be delicious. Use decorated food picks and scary, Halloween themed serving bowls and trays to serve your scary party food ideas. You can find some great Halloween dip bowls at Amazon. Take a look at this vampire's coffin and imagine how cool it will look on your holiday buffet table. 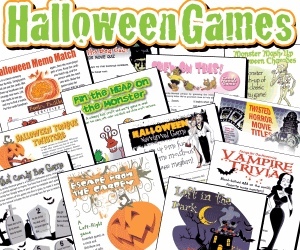 If you are having a party, take a look at these printable Halloween games. There are plenty of fun party game ideas to keep your guests entertained and your party moving along at a fun pace. These party games are perfect for adults and children. Buy one or buy a holiday assortment! Get All Your Halloween Decorations And Party Supplies! Animatronics, Props, Skeletons, Bats, Spider Webs, Fog Machines, Graveyard Tombstones, Costumes, Partyware And More.